Our vegan wraps infused with a proprietary blend of herbs and spices from around the world will delight even the most discriminating palates. With our homemade sauces and dressings, whether it is our succulent seitan chimichurri or pan seared tofu, our fresh fruit smoothies bursting with Omega 3s, or our delectable salads, we know you will be pleasantly surprised. Come give us a chance to open the doors to a culinary experience that might change the way you think about vegan food. What is this seitan (pronounced SAY-tan) stuff anyway? Seitan is an ancient food considered super-food by many. It has been eaten for thousands of years by Chinese and Japanese Zen Buddhists. Our version is completely unprocessed, and packs 26 grams of complete protein into just a 4 oz portion. It is essentially made by rinsing away the starch in wheat, leaving the low-carb, high protein, and nearly fat free gluten behind. Many compare the consistency and taste to chicken. We get our tofu from Banyan foods, a Houston based tofu distributor. Rest assured it is 100% non-gmo. What is quinoa (pronounced KEEN-wah)? Quinoa is an ancient grain like seed that provides an extremely high protein content and has all 9 essential amino acids, making it a complete protein. It is commonly referred to as a super-food for its numerous health benefits. Chimichurri sauce is a tangy green Argentinian sauce. Our house-made version is cilantro and parsley based. We have to say it's delicious! What is the quinoa-rice pilaf? Requesting this option turns your wrap into a salad. 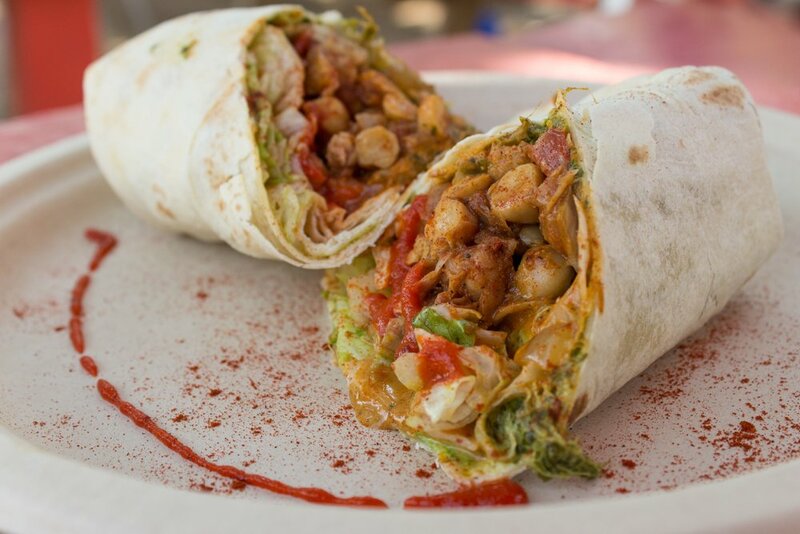 It is gluten-free (unless it is requested with the chimichurri or BBQ wraps), and essentially the contents of the wrap go on a salad. The salad consists of organic quinoa, organic corn, basmati rice, spinach, lettuce, cucumbers, carrots, tomatoes, and grilled onions. Yum!